Most of the pharaohs of the 18th and 19th Dynasties in the New Kingdom (circa 1570-1080 BC) were interred in the parched Valley of the Kings, near Luxor and the Nile River in Egypt. It didn't take tomb robbers long to pilfer the buried treasures that the mummified pharaohs were supposed to take on their voyage to the next world. The ancient robbers somehow missed the tomb of the then insignificant pharaoh Tutankhamun (popularly knowntoday as King Tut). It lay undisturbed in the Valley of the Kings for over 3,000 years until BritishEgyptologist Howard Carter discovered it in 1922. Most of the found treasures are now on exhibit in the Egyptian Museum in Cairo. 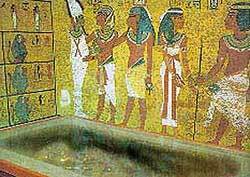 However, the burial chamber (see photo) still contains King Tut's mummy encased in his outermost coffin inside the stone sarcophagus. Archaeologists have retrieved few treasures made of gold and precious stones elsewhere in the Valley of the Kings, but many captivating paintings and hieroglyphics on the tomb walls survive. Of all of them, I found the tomb of Seti I to be the most marvelous.